The only residence within Arches National Park is Wolfe Ranch, first settled in 1888 by Civil War veteran John Wesley Wolfe, who died in 1913 at the age of 84. The very basic one-room cabin is now on the National Register of Historic Places. It is located near the head of the Delicate Arch Trail. Delicate Arch was a feature of the Salt Lake City Winter Olympics in 2002 as one of the sites that hosted the torch relay. The torch entered the state at the Arches National Park where it was blessed by a member of the Ute tribe, Frank Arrowchiss. It was then carried by his granddaughter from Delicate Arch to the top of the trail before being passed on to another torch bearer for the trip to Salt Lake City. The desert or Nelson's bighorn sheep had all but disappeared in the high deserts of the American Southwest by the late 1800s. Some animals were relocated here from Canyonlands National Park in the 1980s, and there are now about 75 of them living in Arches. The Arches in the park aren't permanent: On August 7, 2008, the 71-foot Wall Arch near Devils Garden collapsed. Erosion, the same process that formed the arch, was the likely cause of its collapse-combined with gravity, of course. The extraordinary formations of Arches National Park, which include the greatest density of natural arches in the world, have been shaped by the forces of nature. Wind, rain, erosion, and the porous nature of the sandstone have all combined to sculpt a labyrinth of fanciful arches, hoodoos, balanced rocks, canyons, and fins in beautiful shades of red, orange, yellow, and brown. 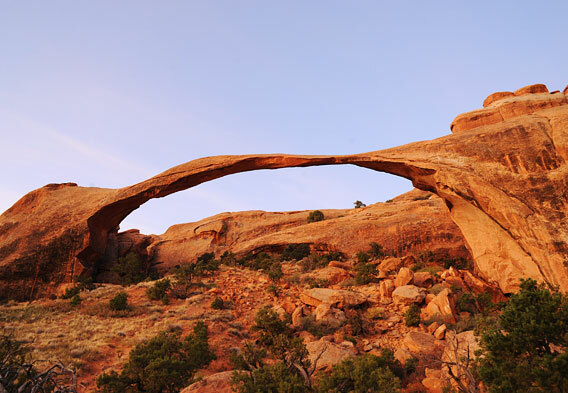 The rock formations in Arches, such as Landscape Arch and Delicate Arch (pictured above), have become iconic symbols of the Southwest. Delicate Arch is the most famous-it appears on the Utah state license plate and on a postage stamp commemorating Utah's statehood, and it was included on the torch run to open the Salt Lake City Winter Olympics. This is high desert country, with altitudes around Arches ranging from more than 4,000 feet to nearly a mile above sea level. It is a landscape of extremes, with very hot summers, very cold winters, and very little rainfall. The temperatures can fluctuate 50 degrees in a single 24-hour period. The plant and animal species here have adapted to this harsh environment, and many of them are found only in this area. Wildlife includes bobcats and foxes, mountain lions and owls, coyotes and mule deer, jackrabbits, eagles, hawks, snakes, and lizards. 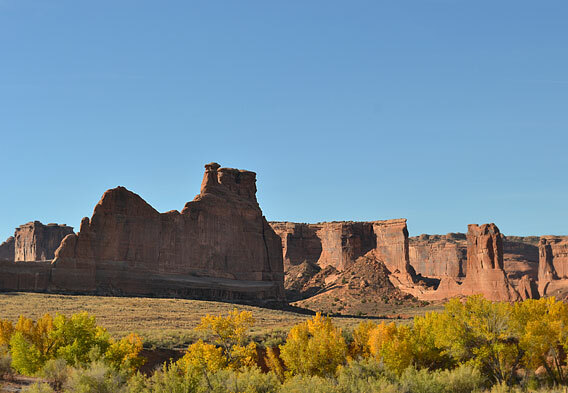 Along with the geological history, the region around Arches has cultural significance as well. The hunter-gatherers of 10,000 years ago came here to find the forms of quartz that were excellent for making stone tools and weapons. By about 2,000 years ago, they began to settle and cultivate crops such as squash, beans, and maize. They built settlements like the Anasazi cliff dwellings of Mesa Verde in neighboring Colorado and Chaco Canyon in New Mexico. The Spaniards passed through the area on what is known as the Old Spanish Trail from Santa Fe to Los Angeles in the eighteenth and early nineteenth centuries, but it wasn't until the mid-1800s that actual settlements were established. The settlers were Mormons who attempted to establish a mission in what is now Moab. By the early 1900s, the fame of the beautiful landscapes began to draw sightseers. In 1929, Arches was made a national monument, and in 1971, it became a national park. Today, visitors come to see the beautiful rock formations. A number of these, like Balanced Rock, are accessible from the main road. Most, like Delicate Arch and Landscape Arch, can only be accessed by hiking trails, and this is the most popular activity for most visitors, as trails cross through the labyrinthine collection of sandstone arches. Landscape Arch is the second-longest natural arch in the world, after Xian Ren Qiao (Fairy Bridge) in Guangxi, China, and it's one of the first arches along the Devils Garden Trail. It is 290 feet long and only 11 feet thick at its thinnest point. It was thicker at one time-16 feet-but a 73-foot piece fell off in 1991 and another piece fell in 1995, which thinned Landscape Arch even further. Along with Delicate Arch, this is one of the best-known features in Arches National Park. Balanced Rock is the most accessible formation in Arches National Park, and consequently it's also one of the most popular. It is plainly visible from the main road, and there is a short, level walking loop (only a quarter mile) path around it. As its name suggests, the formation consists of a 55-foot-high, 3,500 ton rock balanced atop a 130-foot-long column. Drive just over nine miles from the park entrance and you can't miss this amazing sight. 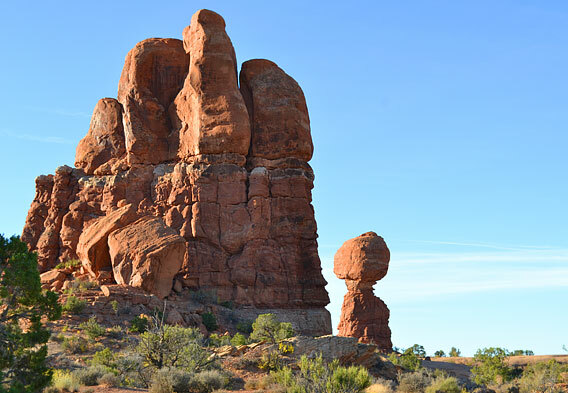 Some of the formations in Arches, such as Balanced Rock, are accessible from the main road, but most are only accessible by hiking, and as visitors come to see the beautiful formations, this is the most popular activity in the park. Courthouse Wash, which does require a shuttle to the trailhead, is a lovely hike on level ground, and the Devils Garden has the longest hike and the most rock formations. Many trails in Arches are quite short, but they're all rewarding, from the beautiful ribbons of rock on the Landscape Arch trail to the panorama from Doc Williams Viewpoint.